Disclosure: I am a Titanic Mom Blogger. No compensation was given in any manner for this post. All thoughts or opinions are my own. As many of you know my family & I visit the Smoky Mountain area in Tennessee every November, so you know I am very familiar with the area. 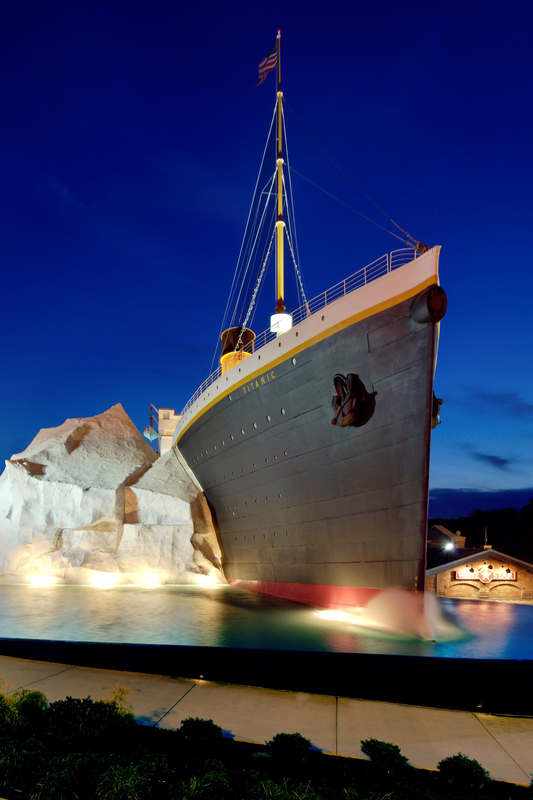 One of the newest attractions in the area is Titanic Museum Attraction. It encompasses history, beauty and the preservation of timeless classics. My family visited the Titanic Museum Attraction last November and we can’t wait to return in 2013. For the 1st and only time in the united States the Wallace Hartley long lost Titanic Violin will be displayed exclusively to Titanic Museum before going up for auction in England. The special event will take place in Pigeon Forge May 22nd-July 27th, 2013 & to Titanic Branson August 1st-15th. 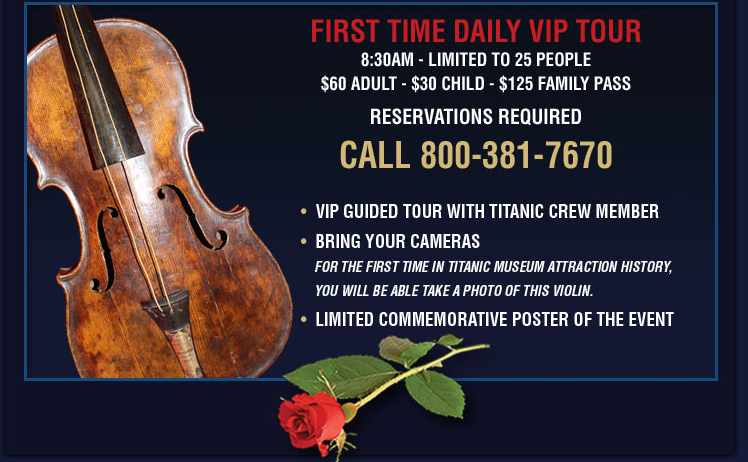 From Titanic: Widely regarded as the world’s leading experts in the sale of RMS Titanic memorabilia, Henry Aldridge and Son have unparalleled experience in auctioning the rarest memorabilia ever to be offered and describe the Hartley Violin as “the Holy Grail.” Throughout the years, the historic violin has had its share of controversy and some have disputed its authenticity. 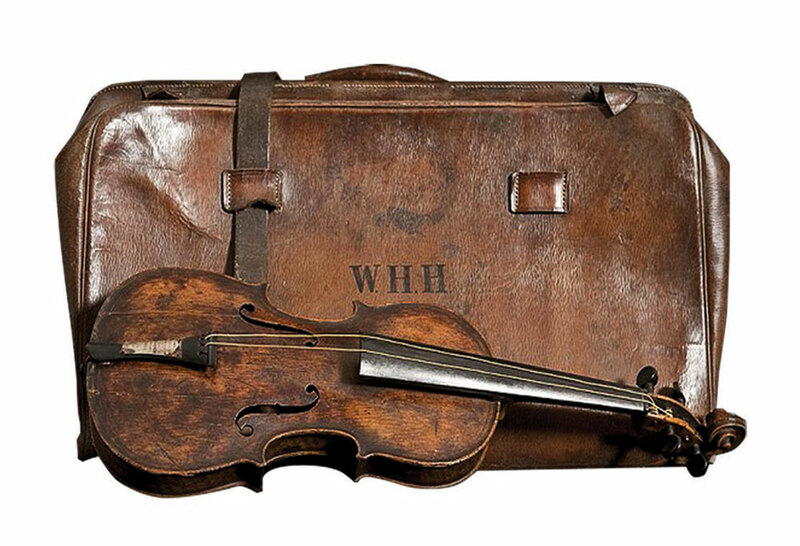 However, with the assistance of some leading experts in their respective fields, an extensive provenance package now exists and according to officials with the Titanic Museum Attractions and leading Titanic experts, the violin belonged to Wallace Hartley. If you enjoy history or the story of Titanic as much as I do, this will be one unveiling you will not want to miss. If you are a local, please let me know if you visit during that time frame. I will not be in the area at the time, but I am very excited to see what others have to say. A portion of the proceeds of all ticket sales Now – June 28 will go to Belmont University in Nashville, Tn in the form of Summer Scholarships to the String Crossings Camp for students in grades 9-12. In addition, Titanic Museum Attraction will offer a Daily VIP Tour that allows visitors to enjoy a guided tour with a Titanic Crew Member. you will also be allowed to bring your camera inside the museum for the first time ever and receive a commemorative poster of the event. A portion of the proceeds of all ticket sales Now – June 28 will go to Belmont University in Nashville, Tn in the form of Summer Scholarships to the String Crossings Camp for students in grades 9-12. What a great opportunity to have an exclusive look, capture wonderful memories, and give back to the community. I loved the Titanic music when I visited, it was an incredible collection and being able to meet the co-owner was amazing and educational. I think it is so interesting to be able to see that Violin. I’ve always been drawn to the story of the Titanic. It would be incredible to see the violin. Love the Titanic, I’m going to have to remember this when I visit that area in the future! There is an Australia man who has been replicating the ship and first trip tickets are at close to a million dollars. I can’t wait to see it completed. Fascinating history as tragic as it was. Wow, I would love to see that violin! Such an amazing story around that violin! This looks like an activity I would LOVE! I’d also just love to visit the entire area – I’ve never been there.